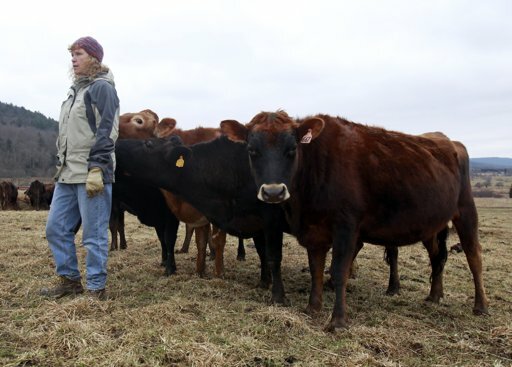 I just read a very interesting article from the Associated Press (AP) this weekend, discussing the predicament in which many dairy farmers in New York state and Pennsylvania are finding themselves. Dairy farming is becoming more and more expensive, as farmers try to keep dairy prices low due to market pressure and lack of government subsidies (we all know those monies go to the big corporate farmers growing corn, soy and tobacco). Many dairy farmers are struggling to stay afloat and are starting to sell their land to the gas extraction companies. These farms sit on land rich in natural gas deep below ground and hydraulic fracturing, also known as fracking, is used to extract. NY state actually has a moratorium on the practice right now, but its neighbor Pennsylvania doesn’t. So many PA dairy farmers have packed up their bags and sold their land for good money. The issue is, fracking may not be safe and contaminate the water and air around the site. Many NY dairy farmers happen to be located right across from these extraction sites in PA, and some of them have complained about water becoming contaminated on their land. :( Fracking = bad; milk + cheese = good! Actually, its like most other things in life; a two-edged sword. A lot of the farms are actually selling subsurface gas rights; not the whole farm. They are then putting the money back into new equipment and upgrading their dairies. While many farmers are concerned about contamination, it is an needed economic windfall for under capitalized farms. I never saw more new equipment on farms than when I last visited the northeastern PA shale region. I’m sure it is very tempting for struggling farmers who really care about their dairy business and want to keep it open to sell part of their land, especially when there’s a large amount of money involved. But I agree too that they may get more than what they wished for. I’m not sure how this will ever get solved, as long as most dairy farmers struggle financially. Makes sence that the Farmers will put the money back into the farm. But hey I don’t want my kids drinking that milk. Who will be testing the milk and regulating the industry. Bad milk but not that bad. Not for me thank you. I’m sure there’s no testing for whatever new particles are being introduced to this milk. I’m hoping the milk I get in California doesn’t get exposed to any fracking close by.